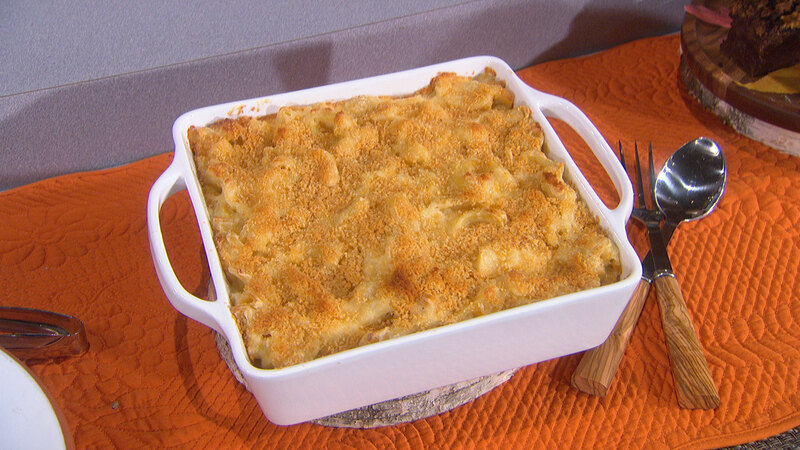 With Thanksgiving right around the corner, Chef Ryan Scott shares fun and delicious side dishes that will spice up your family’s holiday feast. Here are all of his scrumptious recipes from today’s show. 2. Place a cast-iron skillet in the oven. Allow skillet to preheat 10 minutes. 3. 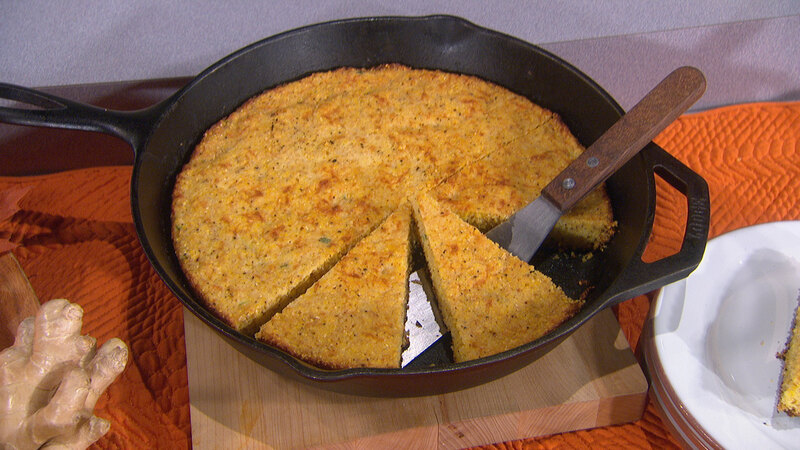 In a bowl, combine cornmeal, salt, black pepper, baking soda, and baking powder. 4. Using a stand mixer, in a separate bowl, combine buttermilk, egg and sour cream. Add a dash of hot sauce and mix until incorporated. Once mixed, add dry ingredients. 5. Place preheated skillet from oven over burner on high heat. 6. Melt lard or shortening to liquid state. 7. While mixer is still running, slowly incorporate lard into the corn mix. 8. Reserve about 2 tablespoons of melted lard in the skillet. 9. Once mixed, fold in white cheddar and jalapeno. 10. Let skillet and melted lard get to a high heat over stove. Once lard is almost smoking, pour corn mix into skillet. Distribute mix evenly through the pan. The batter should begin to sizzle. 11. Cook over high heat for about 2 minutes until the edges begin to fry. 12. Place skillet into oven, and cook about 10-15 minutes. (A toothpick should come out dry when poked into the center). 13. Remove from oven. Slice and serve. 2. Clean the sweet potatoes to remove any dirt on exterior. 3. 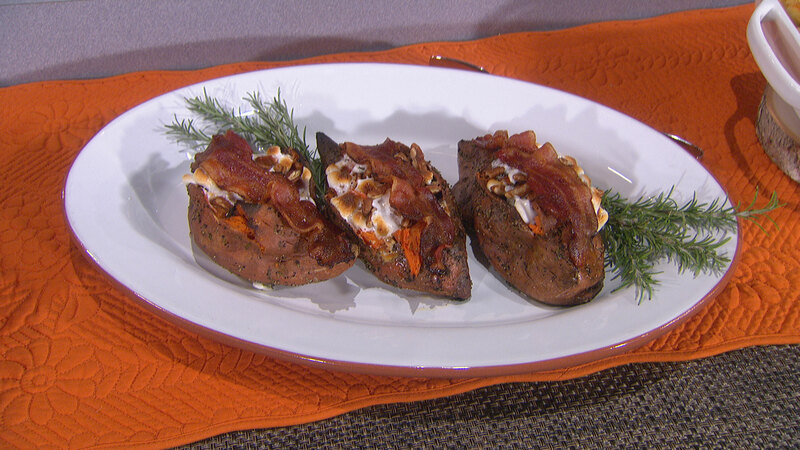 Toss sweet potatoes in corn oil then roll in mixture of black pepper and chopped rosemary. 4. Using a fork, pierce the potatoes, in a few spots. 5. Place the potatoes on a baking sheet. Bake potatoes for 45 minutes or until a knife can go through center easily. 7. Slice sweet potatoes down the center. Push ends towards middle to open up. 8. Stuff potatoes with pecans and marshmallows. 9. Lay a slice of maple bacon over each potato and place back onto the sheet pan. 10. Place back in the oven and let broil until tops are gooey and browned. 1. Place parchment paper on a baking sheet. Place the bacon onto the sheet. 2. Place bacon in the oven and bake about 15 minutes. 3. Remove bacon from the oven and glaze with maple syrup. 4. Return to the oven for another 3 minutes. 5. Remove bacon from oven and let cool. 1. Melt butter in a large pot. 2. Add flour, stirring well to combine until roux is formed and smells nutty, about 10 minutes. 3. Add milk and whisk, making sure to get all the roux incorporated into the milk from the bottom of the pot. 4. Bring sauce to a gentle boil and cook for about 25-30 minutes, until thickened. 5. Follow directions on box and cook elbow macaroni to al dente. Once macaroni is cooked, allow to cool. 6. Set oven to 400°F. 7. Mix in 5 cheese-blend, hot sauce and salt. 8. Blend sauce with a hand blender until smooth. 9. Place macaroni in a casserole dish then cover with cheese sauce, folding in the jack cheese. 11. Place in oven for 15-20 minutes until golden brown. 1. Place aluminum foil over the bottom of a slow cooker. Spray with nonstick spray. 2. Place a medium sized glass bowl over a double boiler and melt butter and chocolate. Reserve butter and chocolate. 3. In a large bowl whisk flour, baking powder, cocoa powder and salt. 4. In a separate bowl, whisk sugar, eggs, and vanilla. Stir in flour mixture thoroughly. Fold in melted chocolate and butter and gently fold in chocolate chips. 5. In another bowl whip pumpkin, pumpkin spice, cream cheese, and ginger. 6. Pour the chocolate mix into the bottom of the slow cooker and shake the sides to create an even layer (or use a spatula). Take the pumpkin mix and place dollops on the brownie mix. 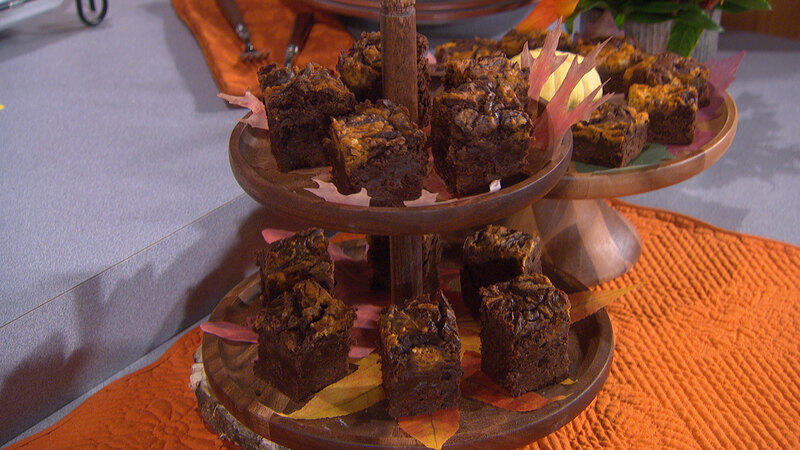 Using a toothpick or butter knife, swirl the whipped pumpkin throughout the brownie mix. 7. Set slow cooker at a low temperature for 3 hours. 8. Remove the lid and cook 30 more minutes to create a crunchy top. 9. Allow to cool then serve.